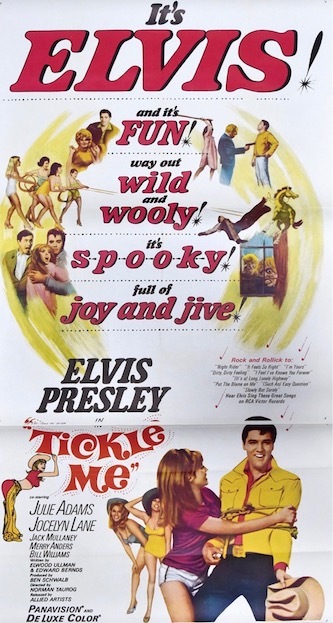 When it was released on May 28, 1965, Tickle Me marked several firsts in the Hollywood career of Elvis Presley. It was the only Presley movie produced by Allied Artists, a studio best known at the time for making “B” comedies and exploitation films. It was one of the few mainstream features released by Allied during the 1960s. Second, Tickle Me was Elvis’s first straight comedy picture. There is nothing resembling a dramatic scene in the film. 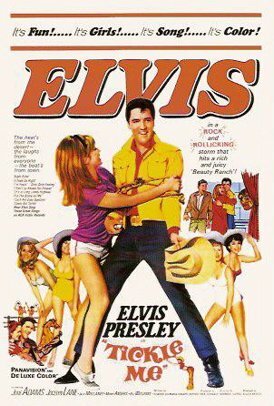 Finally, it was the first and only Presley film without at least one original song. Its nine musical numbers were all taken from earlier Presley recordings, dating as far back as 1960. Tickle Me was another step in the direction of low-budget Presley features begun by its predecessor, Metro’s Girl Happy, which was released just six weeks earlier. Tickle Me was shot completely on Allied’s studio lot in just six weeks during October and November of 1964. Some Arizona scenery footage was added for background. The film cost Allied $1,480,000, more than half of which, $750,000, was paid to Elvis. “Elvis Presley had better watch his step after ‘Tickle Me,’ his latest color musical film. This is the silliest, feeblest and dullest vehicle for the Memphis Wonder in a long time. And both Elvis and his sponsors, this time Allied Artists, should know better. Tickle Me got off to a good start at the box office. On June 16, 1965, just a month after the film opened nationally, the studio claimed in a Variety advertisement that 5,210 play dates had already been booked. A month later an article in the same publication implied that Tickle Me had actually saved Allied Artists from going under financially. By the end of the year, the movie finished #30 on Variety’s list of “Big Rental Pictures of 1965” with $3.4 million of projected sales. Two principal memories remain from when I first saw Tickle Me as a teenager at Spokane’s State Theater in the spring of 1965. The first is that I laughed more during this movie than at any other Elvis film before or since. The gags, one-liners, and slapstick seemed so funny to me then. On the other hand, Elvis’s musical numbers in Tickle Me were disappointing. Back in those days, the greatest lure of a new Elvis movie for a fan like me was getting to hear Elvis sing a new set of songs. The nine tunes cherry-picked from Presley’s previous albums were all good ones, to be sure, but offered nothing new. A few of the songs fit into the storyline but most just come out of nowhere. 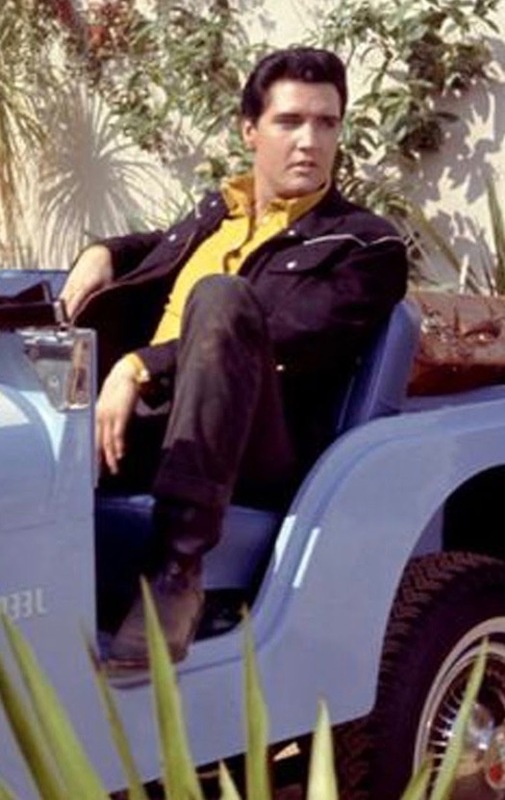 Elvis inexplicably bursts into song a number of times while working as a ranch hand. Of course, scantily clad young women come from all directions to join in each musical number. 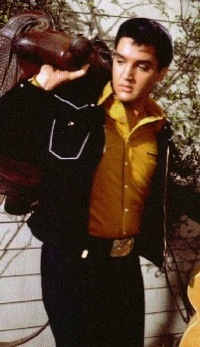 In one rather silly scene, the last word in the lyrics of the tune “Dirty, Dirty Feeling” is supplied, not by Elvis, but by a horse standing nearby. 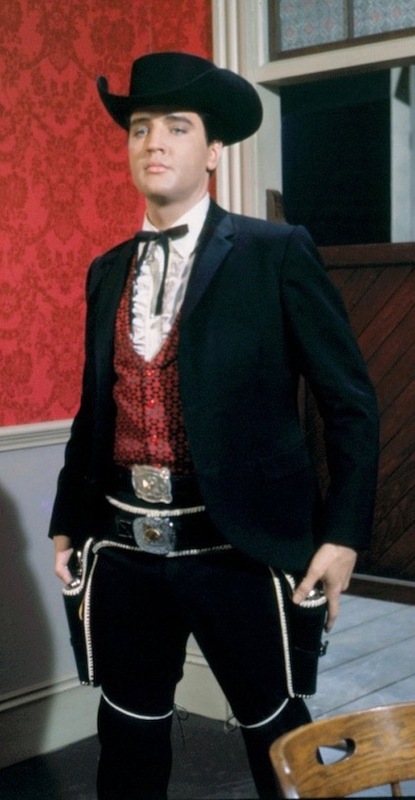 In the movie Red West, a long-time member of Presley’s “Memphis Mafia,” reprises his oft-played role of a tough guy who gets punched out by Elvis. It happens after Presley’s first musical number. When Julie Adams, who plays his boss in the film, approaches Elvis after the fight, he tells her with a swagger, “It happens every once-in-a-while.” Fight scenes had long been a staple of Presley films, but director Norman Taurog overloaded Tickle Me with fistfights. 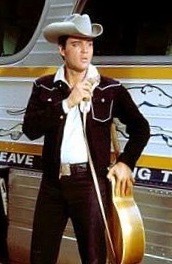 Elvis’s character participates in a half dozen brawls, probably a record for Presley movies. 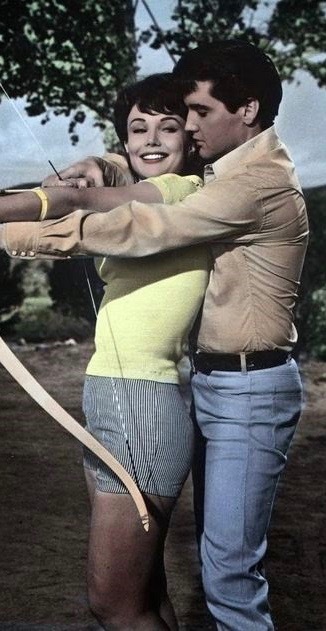 Elvis’s love interest is played by Jocelyn Lane, who is cute as a button but lacks the energetic personality of Ann-Margret or even Shelly Fabares, two of Presley’s recent co-stars at that time. I will say, though, that Miss Lane outshines them all in a bathing suit. The best performance in the supporting cast is provided by Jack Mullaney, who plays bumbling ranch hand Stanley Potter. His quirky character work provides a good portion of the film’s humor. "In the acting department, Elvis fulfills his responsibilities well. The role is a bit more demanding than it seems at first, considering the campy dialogue and clowning that the screenplay calls for."